Multiple-exposure photos demonstrate the dynamics of handling the transducer. Numbered structures on the anatomic diagrams help you learn new information and test your retention at any time. The legend on the back-cover flap folds out for quick reference. Each structure is referred to by the same number throughout the book. Numerous quiz images at the end of each chapter give you an opportunity to test your knowledge. Physical principles are explained concisely with clear, accessible diagrams. Various tips and tricks make it easier for beginners to get started. are a resident in internal medicine, radiology, surgery, gynecology, anesthesiology, or pediatrics who wants to solidify your ultrasound experience. 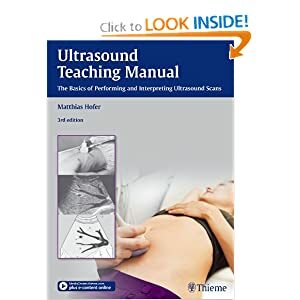 his workbook offers structured, course-like learning, and just like an instructor in an ultrasound course, it guides you systematically through the individual organ systems. The accompanying videos demonstrate basic anatomy for ultrasound, optimum transducer positioning, and the interaction between transducer position and monitor display, allowing you to experience the learning points in real time for a deeper, visual understanding. I think it is broken link.